Mutation of voltage-sensor domains (VSDs) can sometimes lead to ions leaking across the membrane through the VSDs themselves. Ion conduction through the mutated VSD of the Shaker Kv channel was coined the “omega current” by Tombola, Pathak and Isacoff (Tombola et al., 2005). Many different mutations have been identified that result in current leaking through the VSDs of many different channels. This current can be carried by a variety of ions including H+, Li+, K+, Cs+ and guanidinium. It has also been shown that naturally occurring mutations in VSDs that result in omega current leak can lead to channelopathies (diseases caused by malfunctioning ion channels, learn more about them out on wikipedia). In this post, I will discuss a mutation of the Shaker Kv channel that results in omega current leak. I will address how this current arises and what it can tell us about the mechanism of voltage-sensing. Before the term “omega current” was coined, the work of Starace et al. had shown that the Shaker Kv S4 VSD can conduct or transport protons when its S4 arginines are mutated to histidine (an amino acid residue that has a titratable side chain) (Starace et al., 1997; Starace & Bezanill, 2001; I will discuss this work in more detail in a future post). It wasn’t until the work of Tombola et al., in which arginine at the R1 position was mutated to amino acid residues with small side chains, that other ions were seen to conduct through the VSD (Tombola et al., 2005). These ions included Li+, K+, Cs+ and even the large organic ion guanidinium. It was these non-protic ionic currents that were coined the “omega current”. However, please note that, in this and future posts, I will use the term “omega current” to describe currents generated from both proton and non-proton conduction. There is, of course, a significant difference between the conduction of protons via titratable histidines and the conduction of the larger ionic species. Basically, the proton conduction is facilitated by forming short-lived covalent bonds with the histidine side chain, whereas the conduction of the other ionic species is facilitated by the ions simply diffusing through a pore generated in the VSD by the mutation, the so-called “omega pathway” or “omega pore”. As I discussed in my previous post, Pores and Selectivity Filters, pores are aqueous pathways through membrane proteins that allow the diffusion of ions between the intracellular and extracellular solutions. Unlike the larger ions, protons do not require an aqueous pore to conduct through a membrane protein. It is possible for H+ to conduct through a hydrogen-bonded chain: the proton is passed from a water molecule on one side of the membrane to the side chains of titratable amino acid residues and then to a water molecule on the other side of the membrane (see Nagle & Tristam-Nagle, 1983 for a review). In contrast, larger ionic species require a pore. This an important difference between H+ and other ions that must be kept in mind when pondering on mechanisms of H+ conduction through membrane proteins. Here, I will introduce the idea of ion conduction through the VSD by focusing on conduction of large ions through the omega pore. I will go on to discuss the special case of H+ conduction through mutant VSDs in a future post. Only one position of Shaker Kv has been shown to result in formation of an omega pore when mutated (Tombola et al., 2005). This position is the first S4 gating charge residue (R1) of the VSD (Fig.1 top sequence; if you need a refresher on VSD architecture and gating charge residues check out my previous post, The Problem of Aligning S4). It is very hard to judge between these two possibilities from data measured at unnaturally strong hyperpolarizations. As usual, the true case is probably somewhere in between. If any of the other gating charge residues above K5 on S4 (R1, R2, R3 or R4) occupy the charge transfer center, the channel is closed and the VSD is in a hyperpolarized conformation (Fig.1). The stronger and longer you hyperpolarize, the more VSDs transition into a “deeper” hyperpolarized conformation (say R2 moves into the charge transfer center instead of R3 or R4), with the most deeply hyperpolarized conformation having R1 in the charge transfer center (Fig.1). Therefore, the stronger and longer you hyperpolarize, the longer it takes the channel to open upon depolarization, since the VSD has to transition through more hyperpolarized conformations before it reaches the depolarized conformation (i.e. if R2 is in the charge transfer center, the VSD has to transfer through a conformation in which R3 is in the charge transfer center then R4 and finally K5). This hyperpolarization-dependent effect on the rate of channel opening is known as the Cole-Moore effect and has been know since 1960 (Cole & Moore, 1960). I have discussed this model in some detail while reviewing the work of Jensen et al. in previous posts (check it out here) and I will most definitely be writing more about the charge transfer center model of voltage-sensing in the future. Ok, with that in mind let’s reconsider the omega current observations of Tombola et al. The omega pore generated by the mutation of R1 only forms upon very strong hyperpolarizations. Does this mean that the omega pore forms only when a very deeply hyperpolarized conformation is reached? If so, which S4 gating charge residue is in the charge transfer center? Is the “phenylalanine gap” (Fig.1) of the charge transfer center the narrow constriction point that separates the internal and external solutions? In their paper, Tombola et al. measure the gating current generated by rearrangement of the S4 arginines during the hyperpolarized to depolarized conformational transitions. Although most of the gating current and consequent conformational change occur in the physiological range (between -100 and 0 mV), they also show that a small portion of the gating current moves in the range of -200 to -100 mV (Tombola et al., 2005). This indicates a conformational change in the voltage sensor that may be correlated to the opening of the omega pore, suggesting that a deeply hyperpolarized conformation must be reached in order to generate the pore. However, we are unable to say specifically which of the S4 gating charges are in the charge transfer center. If the charge transfer center is the narrow constriction point that separates the internal and external solutions, which is a distinct possibility given the structure of the Kv1.2-2.1 paddle chimera, then we can assume that R1 would occupy the charge transfer center in the deeply hyperpolarized conformation as shown in Fig.1. Hence, in the case of mutation to a smaller side chain, the charge transfer center is left empty in the deeply hyperpolarized conformation and ions can enter and pass through the VSD. However, again we can’t be sure of this, since the Kv1.2-2.1 paddle chimera structure is of the depolarized conformation of the VSD and no experimentally determined structure of any hyperpolarized conformation currently exists. Figure 2. 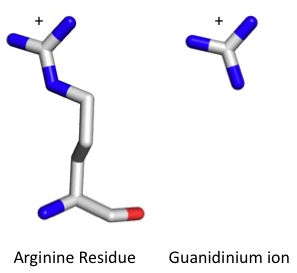 Structure of a arginine amino acid residue compared to the structure of a guanidinium ion. Atoms are shown in the stick representation and colored by atom with carbon grey, oxygen red and nitrogen blue. Hydrogen atoms are not shown. The main chain of the arginine residue is down with the side chain extending upward. Essentially, an arginine amino acid residue is a guanidinium ion tethered to the rest of the protein by three carbon atoms. Tombola et al. thought it was particularly telling that the omega pore generated from mutation of R1 was capable of conducting guanidinium ions (Tombola et al., 2005). This is because the large organic guanidinium ion (large in comparison to the metal ions Li+, K+ and Cs+) is structurally related to the functional group on the side chain of arginine animo acid residues (Fig.2). In a follow up paper Tombola et al. used a quadruply mutated Shaker Kv channel (R362S/S357C/E283D/M256D) in conjunction with cysteine mutagenesis and thiol-reactive agents to characterize the residues in the VSD lining the omega pore (Tombola et al., 2006). They showed that the pore is lined by residues originating mainly from transmembrane helices S1 and S2 (Tombola et al., 2006). These two observations led to the hypothesis that the voltage sensor is essentially a cryptic guanidinium channel that “conducts” the S4 arginines through the different VSD conformations. 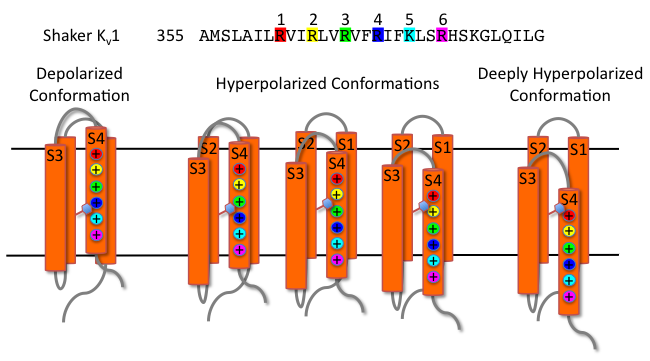 Basically, S1 and S2 form a “pore” that is filled by the “conducting” S4 arginines and as the VSD undergoes conformational changes the S3 and S4 helices move sequentially passing the S4 arginines through the pore. However, when an S4 arginine is mutated to a smaller amino acid, this leaves a guanidinium binding site exposed in the normally blocked pore. If this mutated arginine is R1 (the upper most of the gating charge positions, Fig.1) then this guanidinium biding site is exposed to solvent and an aqueous pore forms that can conduct ions. This is, at least, my understanding of their findings. They go on to use the data to build a model of the closed conformation and to bolster support for the helical screw motion of S4 during gating but these conclusions are based on previous low resolution structures of Kv1.2 and don’t really hold up given the more recent high resolution structures (Tombola et al., 2006; Long et al., 2005; Long et al., 2007). It is interesting to note the similarities between the cryptic pore hypothesis and the charge transfer center mechanism of voltage-gating presented in Fig.1. To me, these hypotheses are consistent. In fact, the charge transfer center may be considered the “selectivity filter” of the cryptic pore: it is the narrowest point that prevents conduction of non-gating-charge-residue ions through the VSD. By mutating the VSD and measuring the omega current, Tombola et al. were able to expose a cryptic pore within the VSD. This omega pore is capable of conducting guanidinium ions, a finding that led the authors to propose that the S4 arginine residues “conduct” through the VSD when the VSD undergoes conformational changes. As the gating charges conduct they cross the electric field of the membrane generating the gating current. Although this model is consistent with more recent observations of gating current movements (Tao et al., 2010), there are many questions that must be considered. How disruptive is the R1 mutation to the VSD structure in general and, specifically, in the putative deeply hyperpolarized conformation? Would mutations of the other S4 arginines result in omega pore formation in different conformations of the VSD? Our primary concern when working with mutant channels is to ensure that the structure and function of the channels is not overly disrupted. VSDs are especially sensitive to mutagenesis and many mutations result in the failure to express functional channels (of course you never hear about these ones since they don’t generally make it into publications). Additionally, the very strong hyperpolarizations required in order to elicit the omega current give me pause. Is this a native conformation of the VSD or is the VSD being forced into a non-native deeply polarized conformation? In order to properly interpret these results we need more structures of VSDs in different conformations. Right now, no experimentally determined structures of VSDs in a hyperpolarized conformation exist. However, some models have been built and people have used these to examine the omega current. If you read this blog, then you probably know how I generally feel about models. I will be discussing these models and what we can learn from them in a future blog post. Experiments in which the other S4 arginines of Shaker Kv channels are mutated to smaller amino acid residues have not been done. As mentioned above, the Bezanilla lab has done some very nice experiments sequentially mutating the S4 arginines of Shaker to histidine. These mutations do not result in omega pores, but H+ omega current is observed. I will discuss these studies in a future blog post. Sometimes, when it is difficult or impractical to do an experiment in the lab, it is possible to let Mother Nature do it for you. In my next post I will be discussing channelopathies that arise from naturally occurring mutations in VSDs that result in omega current leak. What information can we gleam from these natural mutagenesis data and how might shed it light onto the different conformations of the VSD? Catterall, W. A., & Yarov-Yarovoy, V. (2010). Helical motion of an S4 voltage sensor revealed by gating pore currents. Channels (Austin, Tex. ), 4(2), 75–77. Starace, D. M., Stefani, E., & Bezanilla, F. (1997). Voltage-dependent proton transport by the voltage sensor of the Shaker K+ channel. Neuron, 19(6), 1319–1327. Starace, D., & Bezanilla, F. (2001). Histidine scanning mutagenesis of basic residues of the S4 segment of the Shaker K+ channel. Journal of General Physiology, 117(5), 469–490. LettsScience · Biochemistry and biophysics blog.